Welcome back! Today I’m posting Day 14 of the Author Up Challenge. I apologize for not being more consistent. School and work have my brain–and my ambition–fried most days. Day 14: Write a Fantasy. The extended part of the prompt was to explain magic or a monster without breaking the action of a scene. Sounds simple enough. You would think with all of the fantasy I write this would have been the easiest and quickest written prompt, but no. This took a lot of thought and brainstorming and research through older pieces of mine. Because after posting the prologue to Magefire, I am excited to start working on some of my original novels. So I pulled out all of the old manuscripts and printouts, got lost in their wonderful old paper smell, and realized they needed work. In the end, I decided on another prologue. These make good blog posts, I feel, because they’re short and meant to be self-contained yet draw you into a larger story. I’m not 100% happy with where it is currently, but it’s getting there. 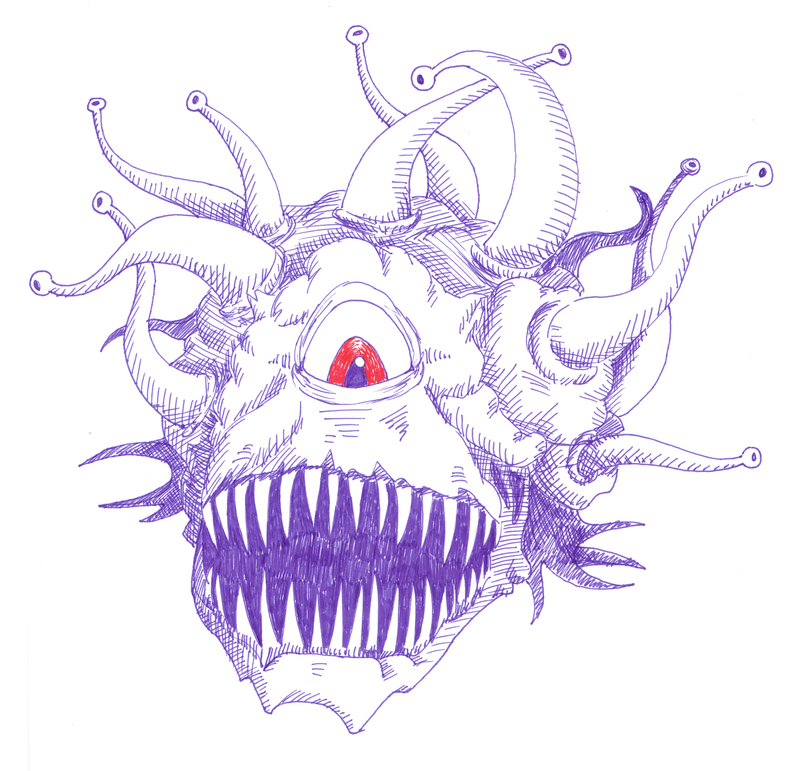 The image above is a pen drawing I did of a D&D beholder way back. I realized I really can’t use a beholder in my own stories. So I researched some different ideas. I decided to call him an “optes,” because it is short for “Panoptes” (meaning “all-seeing”) which was the epithet of Argus, a many-eyed giant from Greek myth. I think that would make the plural of “optes” possibly “optii” but I’m not sure yet. Khushia, send a fire, maybe a crop fire, to break up this monotony, King Krell-Ekam thought. He scolded himself, glad he’d not spoken such a reckless wish aloud. Then he sighed, knowing Maeyv would have laughed along with him at the joke, no matter how poor its taste or serious the possible consequences. It had only been a week, but he felt she’d been gone too long, away visiting her parents. Some days, she seemed the only one who could make him smile. Despite the bustle of the palace and the many people in it, there was little to occupy Krell, except absently stroking the soft leaves of a potted fern to the rhythm of his thoughts. The elves had spent hundreds of years fighting and building towards their hidden existence in Haliaetus. They kept away from the humans and stayed within the shifting paths and protective boughs of the Lost Vale. There had been no recent conflicts, thankfully, despite the ever stricter laws King Maht enforced regarding the elves and those who sympathized with them. Eventually, Krell knew Maht would tire of his hatred from afar and escalate things yet again. But not today it seemed. The tall aspen doors to the throne room opened, and a blonde elf hurried to where Krell sat, bowing apologetically. His light chainmail tinkled and shimmered in the sunlight as he moved. “Your majesty.” His breath was labored. “Yes, Merith, continue if you’re able. What is it?” Krell asked. “Dark elves… Attacking the city…” he managed between breaths. Krell scowled, the lines of his aging face deepening. “How…?” he began, but stopped himself. It hardly mattered. What mattered was driving them out again. He stood and his turquoise robes, disrupted from their peaceful lounging, swirled around his slight but solid frame. Krell’s grey eyes flashed with smoldering anger, matching the silvery wisps brushing his shoulders. “Lead the way, and gather the palace guards as we go. I’ll not sit back while they destroy my city. We must find Grandag–if he bothered to come–and put an end to this.” These cowardly raids have gone on for far too long, he continued silently. And now, they’re not only raiding just inside the Vale, but within Haliaetus! By the time he finished the thought, he was gripping the doorknob to exit the throne room. An odd prickle caressed the back of Krell’s neck and an unplaceable foreboding settled upon him. Merith stood only a few steps behind him. He pushed down the sudden anxiety and threw open the doors, three times his height, but still not brushing the high open ceiling. Krell first noticed a lack of guards outside the door, and second the lack of anyone in the halls. There should have been many elves fortifying it, Merith would surely have brought all who could be spared. The prickle returned and with a frown, King Krell pivoted on his heel. The elf who looked like Merith Quickblade pulled his lips up into a sardonic smirk that darkened his features. It was a look Krell had never seen from his trusted advisor. The face began to transform, the only thing that remained was the hideous smile, and Krell confirmed the source of his unease. “I hate to disappoint.” The dark-skinned elf’s voice flowed like silk over silk as the smile widened. Grandag paced a few steps to his left then back to the right, his ebony robe slithering like an obedient snake behind him. Grandag cackled and cut it off sharply. “Even with your fate and the fate of your dear Haliaetus so tenuous, still your subjects are foremost. So noble.” He paused to let the sarcasm of that word settle. “So stupid.” A contemptuous look replaced the smile. Krell waited silently for him to finish. Grandag’s dark eyes flickered over Krell’s rigid form, disappointed at the lack of response. “You’ll be glad to know I find it more amusing he be alive to tell the others how effortlessly you and your city fell to me after all these years. Then, they are next. Trigerius, Braesinus, they will fall even easier.” The smile returned. Gripping his hand into a fist, Krell summoned the energy of the sun cascading onto his shoulders. It fell on every inch of the palace, through the vaulted glass ceilings above. Yellow light suffused him, stirring his hair and causing his hand to glow with its potential. In one quick movement, the dark elf flicked a small amount of dust into the air and murmured the words of a spell, his hand sparking with fuschia light and the dust incinerating before it could hit the ground. Unnatural blackness surrounded Krell and the power that had been forming in his hand winked out along with it. Krell flinched at the sudden loss. Krell’s vision returned, but the palace remained dark. Grandag’s blackness hung like a cloud above them. “Much better on the eyes,” Grandag said, looking up at his work. Knowing his disadvantage, Krell’s mind fought for another means of escape. That small hope disappeared when a floating creature detached from the murk. Spherical and covered with eye stalks and greyish chitin plating, the bloated thing offended his every sense. In the center of the eyes, which snaked and peered in every direction, blinked a giant, blood-red eye that held his gaze hypnotically and a gaping jagged-toothed maw that seemed to grin at him. An optes. Krell groaned inwardly. When did Grandag ally with such detestable creatures? “Your guards were most flavorful, especially given their valiant but feeble attacks,” the optes growled in a deep, resonating voice that made made Krell think of boulders colliding together. “Yes, good, Tara. Burn the city to the ground. Let them watch from their trees.” Grandag’s face lit up. “Yes, milord. And the palace?” She flicked her cold gaze over Krell before it returned to Grandag. Tara nodded and left the way she’d come. Grandag looked back the Krell, his smile sending a cold chill down the light elf’s spine. “Xranth, please make our guest comfortable for his journey.” Then, Grandag began to walk away. Krell stiffened, his eyes meeting the central one of the optes. It was closer, moving silently through the air, and Krell had to swallow down the bile rising in his throat. One of the smaller eyes snaked around and filled Krell’s vision. His eyes grew heavy and he knew no more. This entry was posted in Author Up Challenge, Fantasy, Short Stories, World of Dadreon, Writing Prompts and tagged #AuthorUp, Fantasy Fiction, Short Stories, World of Dadreon, Writing Prompts. Bookmark the permalink.